The EU Marine Strategy Framework Directive (MSFD) requires Member States to assess the costs and benefits of Programmes of Measures (PoMs) put in place to ensure that European marine waters achieve Good Environmental Status by 2020. An interdisciplinary approach is needed to carry out such an assessment whereby economic analysis is used to evaluate the outputs from ecological analysis that determines the expected effects of such management measures. This paper applies and tests an existing six-step approach to assess costs and benefits of management measures with potential to support the overall goal of the MSFD and discusses a range of ecological and economic analytical tools applicable to this task. 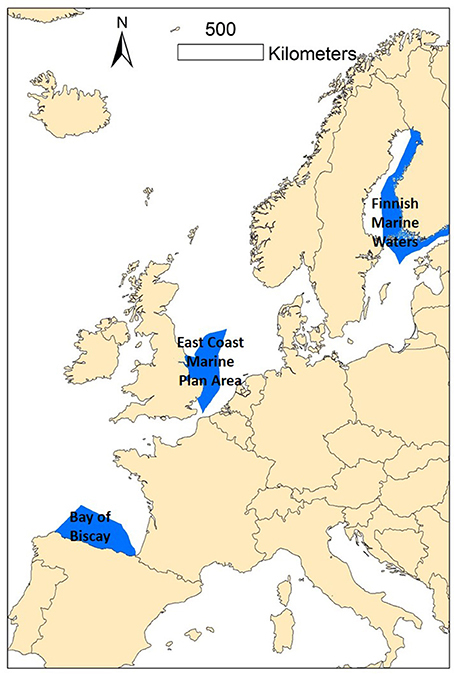 Environmental cost-benefit analyses are considered for selected PoMs in three European case studies: Baltic Sea (Finland), East Coast Marine Plan area (UK), and the Bay of Biscay (Spain). These contrasting case studies are used to investigate the application of environmental cost-benefit analysis (CBA) including the challenges, opportunities and lessons learnt from using this approach. This paper demonstrates that there are opportunities in applying the six-step environmental CBA framework presented to assess the impact of PoMs. However, given demonstrated limitations of knowledge and data availability, application of other economic techniques should also be considered (although not applied here) to complement the more formal environmental CBA approach. The importance of biodiversity in providing ecosystem services and human wellbeing is globally recognized (MEA, 2005; Haines-Young and Potschin, 2010; Mace et al., 2012), with international agreements and legislation introduced to address biodiversity loss (e.g., Convention of Biological Diversity, 1992). For the 27 countries in the EU, there is legislation aimed at halting biodiversity loss and promoting the sustainable use of the ecosystem services that the natural environment supports (e.g., Common Fisheries Policy, Habitats and Birds Directives, Water Framework Directive). Regarding the marine environment, the EU Marine Strategy Framework Directive (MSFD, 2008/56/EC) was promulgated in 2008 as a means to ensure that European marine waters achieve Good Environmental Status (GES) by 2020. To this end, the MSFD requires Member States to define environmental targets and associated indicators and to develop and implement Programmes of Measures (PoMs) that will ensure the achievement of GES. To comply with MSFD, all EU Member States undertook a baseline assessment of the current state of the marine environment in their jurisdictions in 2012. These assessments were carried out considering the 11 MSFD Descriptors for defining GES in marine waters (Table 1), with each Descriptor, having an associated set of criteria (29 in total) and indicators (56 in total; EC, 2010). During this initial assessment, several Member States defined reference conditions and targets that determine GES for these indicators (e.g., Anon, 2012). Prior to the implementation of the various PoMs the MSFD requires that each Member State undertakes an impact assessment, including environmental cost-benefit analysis (CBA), on any measure they are planning to implement to support the realization of GES (Article 13.3; EC, 2015). Table 1. MSFD Descriptors (according to Annex 1, 2008/56/EC). In principle, environmental CBA can be used to quantify and compare all of the costs and benefits resulting from a particular policy measure in monetary terms (Boardman et al., 2006). To this end, positive and negative environmental, economic, and social impacts accruing to relevant stakeholders, including the general public, have to be assessed, quantified, and where possible valued monetarily. Even if certain effects cannot be valued in monetary terms environmental CBA requires at least a listing and acknowledgment of “all costs and benefits of a policy” (Hanley, 2001). The effects that can be monetized can then be compared in a partial CBA (EC, 2015). This analysis should include goods and services with market value, but also those which are not traded in markets and hence have no market prices (Hanley and Barbier, 2009; EC, 2015). Environmental CBA requires an interdisciplinary approach involving the collaboration of natural and social scientists (Hyytiäinen et al., 2015). Costs of environmental management measures may include administration and enforcement costs, income losses resulting from a specific policy measure or opportunity costs. The benefits are typically more diverse and include direct effects of environmental change on prices of marketable goods, household incomes and firms' profits, in addition to changes in the provision of those ecosystem services which are outside the market. The requirement for socio-economic analysis by the MSFD, in particular the implementation of environmental CBA, has been discussed within the literature (COWI, 2010; Bertram and Rehdanz, 2013; Bertram et al., 2014) along with a focus on the appropriate methods for its implementation (Turner et al., 2010; WG-ESA, 2010; Reinhard et al., 2012; Interwies et al., 2013a,b). Bertram and Rehdanz (2013), Hanley et al. (2015), and Oinonen et al. (2016) discuss the limitations of economic valuation in the context of the MSFD and point out that certain challenges threaten the effectiveness of this policy instrument. These latter studies highlight the challenges of translating changes in ecosystem service provision into welfare benefits changes. As such, existing valuation studies in the marine environment focus too much on direct ecosystem benefits (e.g., recreation), which are relatively easier to value, and often ignore less tangible effects on human welfare (e.g., aesthetic for spiritual wellbeing; Atkins et al., 2013). It has been recognized that a major challenge of using environmental CBA in an MSFD framework is “the lack of knowledge on the links between potential measures, improvement of marine ecosystems and corresponding economic and social value” (EC, 2015, p. 29). One reason for this may be the potential non-linear form of links between changes in ecosystem properties and functions, ecosystem services and benefits. A second reason relates to the potential cumulative effects on services and benefits resulting from concomitant implementation of several measures. This latter issue also implies a risk of double counting when implementing an environmental CBA. 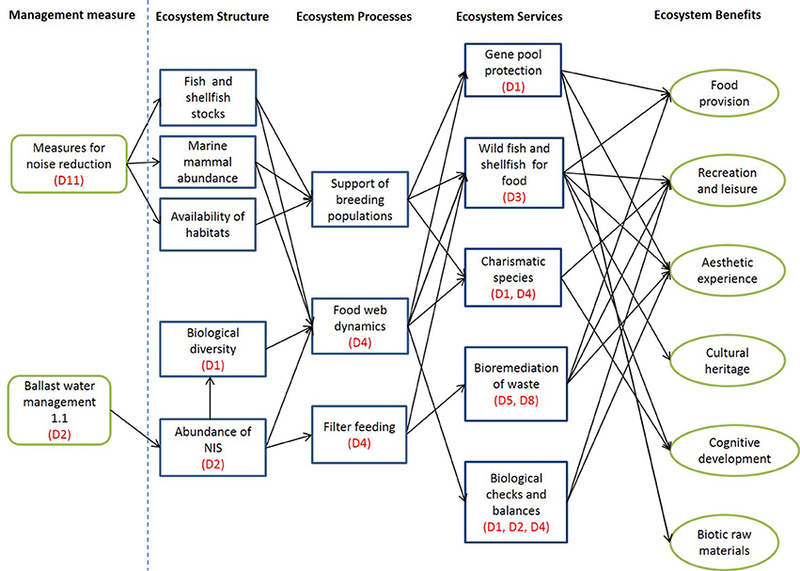 While it has been suggested that ecosystem service classifications are a way to map and assess these links (Interwies et al., 2013b; Bertram et al., 2014; Maes et al., 2014), a comprehensive conceptual framework does not exist for the use of ecosystem service approaches in the assessments of benefits arising from the implementation of a PoMs under the MSFD. An additional challenge is the limited number of valuation studies related to marine ecosystems (Atkins et al., 2013), with most of such studies focussing on coastal ecosystems, such as beaches (e.g., Nunes et al., 2015), seagrass beds (e.g., Börger and Piwowarczyk, 2016), and fisheries (e.g., Crilly and Esteban, 2013). Adding to existing guidance of applying environmental CBA to marine ecosystems for the MSFD (WG-ESA, 2010; EC, 2015), this paper presents applications of environmental CBA from three Member States: Finland, the United Kingdom (UK), and Spain. Each case study takes a different approach to this task, based on differing conditions at each site, data availability, and the nature of the descriptor(s) under study. To make case studies comparable an established six-step process of environmental CBA will be applied an tested (after Hanley and Barbier, 2009). In this way, strengths and challenges of each study can be interrogated in a systematic way and strengths and weaknesses highlighted. As a secondary objective, this paper also scrutinizes the applicability of ecosystem service approaches to facilitate the assessment of ecosystem benefits under the MSFD. It considers the challenges of the valuation of ecosystem benefits specific to the MSFD and the function of ecosystem services as a link between an impact assessment of environmental management measures and monetary valuation. Although, not explicitly required by the MSFD, the use of an ecosystem services approach for this task has been suggested (WG-ESA, 2010; Koss et al., 2011) because it can: (1) assess trade-offs between the provisions of different services; (2) mitigate the risk of double-counting by concentrating on final ecosystem services (Fisher et al., 2009); (3) support the mapping of changes in the provision of ecosystem services spatially; and (4) facilitate value transfer by offering established ecosystem services classifications. It will thereby extend and specify the analyses in Bertram and Rehdanz (2013) and Bertram et al. (2014) and propose an ecosystem services approach as a potential step forward. This paper is particularly relevant to six of the MSFD Descriptors: D1 Biological diversity; D2 Non-indigenous species; D3 Commercially exploited fish and shellfish; D4 Marine food webs; D6 Sea floor integrity; and D11 Energy including underwater noise. In the context of the MSFD, the definition of measures to be implemented may include technical, legislative, economic, and policy-driven actions (EC, 2015). Here, it is the PoMs to achieve GES which are the focus of any environmental CBA to be conducted in an MSFD framework. According to the MSFD, management measures can be classified as existing or new measures. Existing measures (Article 13.1 and 13.2) are those which are based on non-MSFD legislation and which have been fully or partially implemented (Categories 1.a and 1.b, respectively). New measures (Article 13.3) are those which are additional to measures based on existing legislation and build upon them or are completely new (Categories 2.a and 2.b, respectively). The different types of measures available and/or implemented underpin the selection of case studies in this paper. In the Finnish case a catalog of new measures (Categories 2.a and 2.b) which are about to be administered by the relevant authorities are used for the analysis. In the UK case, focus is entirely on potential new measures (Category 2.b), which were not included in the package of measures for the first cycle of MSFD implementation in the UK. In the Spanish case study, the measures investigated fall into Category 1.b, which are based on the Common Fisheries Policy (CFP), but contribute to the achievement of GES under the MSFD. By selecting three contrasting case studies across Europe, this allows for a comparative study of approaches to environmental CBA based on different categories of MSFD PoMs. • Ecosystem and bio-economic modeling: Models project the short and long-term ecological, economic and social impacts in a quantitative way (Peck et al., 2016). A set of indicators is defined together with specific reference values, and analysis includes if and how many objectives can be achieved. Different models enable an indicator-based approach to provide assessments of the successes and failures of management systems with regard to the sustainability dimensions (economic, biological, social, and institutional). For example the Socioec project (EU FP7; http://www.socioec.eu) emphasized that there is a range of models in fisheries to assess impact of management options required by the Common Fisheries Policy (EC, 2013). • Expert elicitation: Where ecosystem (or bio-economic) models do not exist, effectiveness of measures can be estimated based on expert elicitation, such as from group interviews (MAGRAMA, 2015; Oinonen et al., 2016). • Scenario analysis: This approach can be used, together with, or as an alternative to, “what if” modeling, involves the construction of hypothetical, albeit plausible, scenarios (Turner et al., 2014). It can be used when the level of uncertainty with respect to, for example, the data available for the analysis or future policy circumstances/effects is high. The Millennium Ecosystem Assessment (MEA, 2005) defines scenarios as “plausible alternative futures, each an example of what might happen under particular assumptions.” For example, Haines-Young et al. (2011) developed six different but internally coherent socio-economic storylines for the future of the UK under the impact of climate change under the UK NEA project (uknea.unep-wcmc.org). • Ecosystem service assessments: Ecosystem services are the direct and indirect contributions that ecosystems provide for human welfare (de Groot et al., 2010). 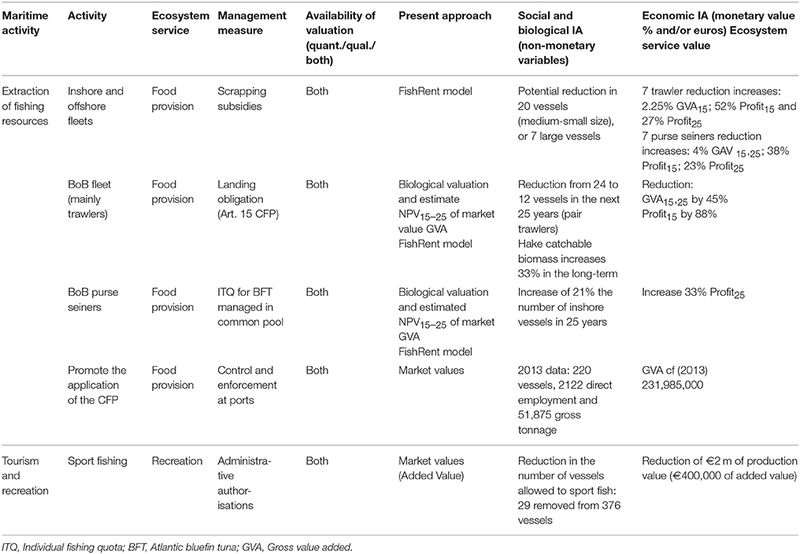 The merit of applying an ecosystem services approach for economic valuation is that it provides an exhaustive classification of all channels through which these services are provided (e.g., MEA, 2005; TEEB, 2010; UK NEA, 2011) as well as an explicit differentiation between ecosystem functions, the services they provide and the benefits that are secured for humans (Boyd and Banzhaf, 2007; Fisher et al., 2008; Ojea et al., 2012; Turner et al., 2015). In practice, indicators have to be developed to capture the extent of ecosystem service delivery in a quantitative way and these ecosystem service indicators need to be linked to a set of ecosystem benefit indicators that describe the resulting benefits for society (Atkins et al., 2015; Hattam et al., 2015). The impact of PoMs measured quantitatively require valuation to arrive at monetary estimates of both costs and benefits. Cost quantification involves the identification of the opportunity costs that will be incurred due to the implementation of and compliance to the management measures. The costs often included are costs to the regulator and/or government, costs to businesses or industry for complying with the management measure including loss in income or Gross Value Added, potential environmental or damage costs and social costs. The quantification of benefits has been an area of active research by environmental economists for decades (Cummings et al., 1986; Mitchell and Carson, 1989; Bateman et al., 2002; Freeman et al., 2014), and a number of techniques to monetize impacts of environmental change have been developed (see for example Atkins et al., 2013). Marketed goods affected by such change (e.g., fish catches) can be valued using market prices, although these may not fully reflect the value of this provisioning service if market imperfections exist. Valuation of non-market effects can be undertaken by applying revealed and stated preference methods. Revealed preference methods, such as the travel cost method (Ward and Beal, 2000) or hedonic pricing (Palmquist, 1999) observe human behavior or economic outcomes and infer the value of non-market aspects of environmental change. Stated preference methods, such as contingent valuation (Carson and Hanemann, 2005) and discrete choice experiments (Louviere et al., 2000) are survey-based and directly elicit willingness to pay for improvement in environmental quality, which can be aggregated over the whole population affected to arrive at the total economic value (including use and non-use values) of any particular change. Stated preference methods can also assess benefits ex-ante, i.e., before a project is implemented and values are generated, in contrast to other valuation methods which can only assess values from an ex-post perspective. However, when primary valuation studies are not available for a particular study site, benefit transfer has been proposed as a tool to apply values estimated for other locations to the site in question (Richardson et al., 2015). respectively. δ is the discount rate, which might differ between case studies. MSFD related PoMs would pass the net present value (NPV) test if discounted benefits outweigh discounted costs, i.e., PVB > PVC (after conducting a sensitivity analysis, see Step 6). Put differently, the implementation of the proposed measures increase social welfare and hence should be implemented from a welfare economic perspective if the discounted net benefits (PVB − PVC > 0) are positive. There may be other perspectives that could call for the measures to be rejected, for example with respect to social acceptance or equity. It is often the case that scarce evidence and a lack of sufficient data requires assumptions to be made at different stages of the analysis. To test the dependency of the results on any one assumption, sensitivity analysis can be applied by altering any one assumption and investigating the implications on the results. The particular challenges of applying environmental CBA to PoMs within the MSFD lie in Steps 2 and 3. This challenge will be further investigated below. While following the general framework of environmental CBA laid out above, three case study analyses were conducted independently of each other, each responding to particular requirements and challenges in their own geographical locale. A summary of the three case studies is presented in Table 2. Figure 1 indicates their location in Europe. Table 2. Summary of the case studies in relation to the six-step CBA framework. Figure 1. Location of the case study sites. The Finnish case study describes the economic analyses undertaken to support the preparation of the national PoMs for the MSFD. The national PoMs Working Group led the process and prepared and planned the new measures. The Working Group members were environmental scientists and other related officials, researchers, and NGOs. The Finnish government approved the PoMs in December 2015 after a public hearing process. There was a consensus within the national PoMs Working Group that a gap existed between the present status of the marine environment and GES, and thus a list of potential measures falling into Categories 2.a and 2.b was compiled (Table 3). A sub-group of economists was established and as requested by the MSFD (Article 13) its mandate was to conduct the cost-effectiveness and CBA of the new measures. Table 3. New measures in the Finnish PoMs (source: Oinonen et al., 2016). The impacts of the PoMs were assessed as part of the cost-effectiveness analysis (Oinonen et al., 2016). The environmental effectiveness of a measure was defined as the probability of closing the gap between the present environmental status and GES. The joint effectiveness of two or several measures was computed combining the distributions of the individual measures. This allowed the calculation of probability estimates regarding GES achievement by 2020 for each MSFD Descriptor. Due to the lack of comprehensive ecological-economic models applicable for MSFD-related analyses, the estimates of the effectiveness of measures were based on expert elicitation. The data were collected in six thematic workshops that followed a structured group interview format. Each workshop had 6–13 experts discussing 6–10 measures. Similarly to the impact evaluation of the PoMs, the costs of measures were estimated using expert elicitation and conditional probability distributions. The cost estimation was conducted during the same workshops that estimated the environmental impacts of the measures. The expected total costs for the Finnish PoMs were estimated at €136.2 m (Oinonen et al., 2016). The cost-effectiveness analysis provided a ranking of new measures and proposed a set of cost-efficient candidate PoMs. The number of measures in the cost-efficient candidate PoMs ranged from 21 to 31 and the expected costs of the PoMs ranged from €20 to €136.2 m.
The economic benefits of the PoMs were estimated based on existing valuation studies on the benefits of improving the state of the Baltic Sea. These studies elicit people's willingness to pay for specific (mainly cultural) ecosystem services, i.e., recreational and non-use values. Previous work revealed that it is relatively straightforward to link the valuation studies directly to the Descriptors of GES, instead of linking the Descriptors to ecosystem services and further to valuation studies (Hasler et al., 2016). Thus, the approach connected the benefit estimates directly to the change in the status of the GES Descriptors. Three criteria were considered when choosing the economic valuation studies, to ensure the results would be reliable. Firstly, we followed the cost-effectiveness analysis (Oinonen et al., 2016) and focused on those GES Descriptors which were assessed as not achieving GES in the Initial Assessment in 2012, i.e., D1 (Biological diversity), D4 (Food webs), D5 (Eutrophication), D8 (Concentration of contaminants), D9 (Contaminants in fish and other seafood). Secondly, the search was limited primarily to valuation studies in Finnish marine waters. When Finnish waters' studies were not available, the suitability of valuation studies conducted in the other coastal countries of the Baltic Sea were considered. Thirdly, studies conducted within the last 5 years were used to provide up-to-date benefit estimates based on state-of-the-art valuation methodologies. In the estimation of benefits, the Descriptors for biological diversity (D1) and food webs (D4) were combined due to their partial overlap, but were treated separately from eutrophication (D5). This approach to the Descriptors was consistent with their treatment in the valuation studies; there was a valuation study focusing solely on eutrophication, and another focusing on characteristics pertaining to biodiversity and food webs, both using stated preference methods and estimating use and non-use values. A recent contingent valuation study on eutrophication (D5) (Ahtiainen et al., 2014) provided a value estimate of improving the eutrophication level in the Baltic Sea from the business-as-usual state to a (near) good state by the year 2050 (all other basins except the northern Baltic Proper would achieve good state). According to the study, the benefits of reaching GES to the Finnish population until 2050 would be €3580 m, of which €1022 m would accrue until 2020. The characteristics used to describe eutrophication in the valuation study were water clarity, blue-green algal blooms, fish species composition, underwater meadows, and oxygen conditions in sea bottoms. These are clearly linked to the Descriptor on eutrophication (D5) and its more detailed characterization, which mentions water clarity, algal blooms, ecosystem effects, and oxygen deficiency (Finnish Ministry of Environment, 2014). The differences between the timeframe of Ahtiainen et al. 's (2014) study and the timeframe of the PoMs to achieve GES (2050 vs. 2020), as well as the differences between Ahtiainen et al. 's (2014) study area (the entire Baltic Sea) and the area of the case study (Finnish marine waters) were assumed to work in opposite directions. The longer timeframe may have led to lower benefit estimates, and the larger geographic area to higher estimates compared to the MSFD policy change. The benefit estimate for the Descriptors for biological diversity (D1) and food webs (D4) was based on a choice experiment study that valued the preservation of pristine areas, increases in the amount of healthy vegetation (such as underwater meadows) and the size of fish stocks (Kosenius and Markku, 2015). The study indicated that the benefits to the Finnish population would be €363–1068 m, with the lower bound estimate including only the preservation of pristine areas and the upper bound including all three improvements in the marine environment. The attributes of the choice experiment are related to the Descriptors of biodiversity and food web and their specification (Finnish Ministry of Environment, 2014). Preservation of pristine areas and healthy vegetation can be linked to the area of distribution and status of species and biotopes in D1, whereas the condition of fish species is linked to healthy fish populations in D4. In Kosenius and Markku (2015), the timeframe coincided with the MSFD target year of 2020. Although, the benefits were estimated for the entire Finnish population, the study area was limited to the archipelago between Finland and Sweden. It is likely that the benefits would be larger if the environmental change were to take place in the entire Finnish marine area. A challenge with both valuation studies was that the baseline and target scenarios specified in the studies do not necessarily correspond with those of the MSFD. As the value estimates are dependent on the extent of the change in the marine environment, this may cause some uncertainty in the benefit estimates. However, as no reliable correction for the differences was available, it was deemed better to use the original estimates than to apply some ad-hoc adjustment factors. No benefits could be estimated for contaminants in the marine environment (D8) and contaminants in seafood (D9) due to a lack of site-specific evidence. The few existing valuation studies on contaminants in the Baltic Sea focus on individual substances, e.g., tributyltin (Noring et al., 2016) or oil (Ahtiainen, 2007; Juntunen et al., 2013). Moreover, the new measures targeting contaminants are related to research activities (measures 30 and 31 in Table 3) thus their contribution to achieving GES by 2020 was assessed to be very low (Oinonen et al., 2016, Table S2). Both the costs and benefits were discounted to the year 2014 using a discount rate of 3%. The net present value (NPV) of achieving GES for biological diversity (D1), food webs (D4) and eutrophication (D5) in 2020 is around €2000 m. However, the PoMs will not lead to GES in terms of these Descriptors in Finnish marine waters by 2020; based on the environmental effectiveness assessment as part of the cost-effectiveness analysis (Oinonen et al., 2016), the probability of reaching GES by 2020 is 0.77 for biodiversity and food webs, and 0.02 for eutrophication. Consequently, the benefits of this particular PoMs are lower than the benefits of achieving GES. To obtain the expected benefits from the PoMs the benefits were multiplied with the probability of reaching GES yielding benefits to the Finnish population of €300–894 m (Table 4). Most of the benefits result from improvements in D1 and D4, as the probability of achieving GES is relatively high for these Descriptors. Reducing eutrophication would also lead to significant benefits, but due to the low probability of reaching GES by 2020, the expected benefits are low. Table 4. Estimated benefits of implementing PoMs and achieving GES in Finnish marine waters. Comparison of the estimated benefits (€300–894 m) to the costs (€140 m) of the Finnish PoMs indicates that despite the fact that the GES will not be achieved by 2020, the benefits of the PoMs exceed the costs by a factor of between 2 and 6. As part of the sensitivity analysis, the benefits are presented as a range instead of point estimates. This range reflects different time frames and the extent of the environmental change. Although, there are interlinkages and overlaps between the Descriptors of eutrophication and biodiversity/food webs, there was very little overlap in the environmental change descriptions in the valuation studies. As the valuation studies covered only three of the 11 GES Descriptors, and other features of the valuation studies (time frame, study area) were considered to lower the value estimates compared to valuing the achievement of GES in the Finnish marine waters by 2020, the risk of double-counting and overestimating the benefits was considered low. Using different budget constraints, Oinonen et al. (2016) provided a set of cost-efficient PoMs. The PoMs that included all measures and had the highest costs was selected and approved by the Finnish government. This might be due to the fact that it was impossible to achieve GES by 2020 with any of the proposed candidate PoMs, as it would take longer for most measures to take full effect. A candidate PoM, that would not significantly change the probability to achieve GES, would decrease the costs from €1362 to €90 m and thus the benefit-cost ratio would increase from 2–6 to 3–9. The UK case study, the East Coast Marine Plan (ECMP), was selected as a case study because it is a defined area of management, being the first area in England where marine planning has been undertaken and a marine plan produced. The GES management measures considered in this paper for the ECMP are associated with reducing the impact of underwater noise (UWN) and invasive alien species (IAS) which are a subgroup of non-indigenous species. These pressures were selected for analysis so that only additional MSFD management measures can be studied, that is those which are not implemented based on existing legislation (Category 2.a and 2.b).The analyses of both sets of management measures use an ecosystem services approach to assess their benefits. It became apparent that the evidence base was limited regarding both the impacts of UWN and IAS on ecosystem services and more generally on ecosystem services within the ECMP area. The assessment of costs and benefits of PoMs with respect to these two pressures was therefore applied using a scenarios approach which facilitates the transparency of making assumptions for each scenario during the course of the analysis. Noise is addressed in the MSFD within D11 (underwater energy including noise), with effects upon D1 (biological diversity), D3 (commercial fisheries), and D4 (food webs) (Figure 2). In the ECMP area the main sources of underwater noise are likely to be associated with shipping and offshore construction such as marine energy development. Due to the scarcity of scientific data relating to the impacts of sound, management measures are limited, particularly for fish and invertebrates (Popper et al., 2014). This has led to uncertainty regarding how regulators, stakeholders and scientists should proceed when so many activities produce underwater sounds (Hawkins and Popper, 2014; Hawkins et al., 2014a). Figure 2. Links between management measures and ecosystem structure, services and benefits. Services and benefits as per Hattam et al. (2015). Noise may affect behavior and physiology and may also elicit injury or damage in those exposed; there has been more research to date regarding marine mammals (e.g., Nowacek et al., 2007; Weilgart, 2007) than fish and invertebrates although this area is growing (e.g., invertebrates: Wale et al., 2013; Solan et al., 2016). Similarly there has been a focus upon short term behavioral changes, for example schooling variation in fish (Hawkins et al., 2014b) rather than on longer term impacts such as reproductive changes. Pile driving of wind turbine foundations produces substantial impulsive noise which has potential effects on a number of marine species through the water and vibration through the sediment (reviewed in Roberts, 2015). Approaches to minimize the impacts of piling come at a cost to the wind farm developer, and encompass either engineering solutions (such as inflatable pile sleeves) or biological monitoring (such as employment of marine mammal observers) (Würsig et al., 2000; Nedwell J. et al., 2003; Nedwell J. R. et al., 2003; Thomsen et al., 2006; Nehls et al., 2007; Parsons et al., 2008). For shipping, which produces a continuous sound, mitigation examples include reduction of vessel speeds, exclusion from biologically sensitive areas or attempts to use “quieter” ships (De Robertis and Handegard, 2013). Non-indigenous species are species, subspecies or lower taxa that occur outside of their natural range following intentional or unintentional introduction due to human activities (Ojaveer et al., 2014). Invasive alien species (IAS) are a subset of non-indigenous species that have been defined as having a “significant negative impact on biodiversity as well as serious economic and social consequences” (EC, 2014; Ojaveer et al., 2014). Their introduction has long been recognized as a key threat to marine ecosystems and the services these deliver. Non-indigenous species and therefore IAS are addressed by D2, but they also affect other Descriptors due to their potential impact on biological diversity (D1) and to food webs (D4) through changes in feeding relationships (Figure 2). In the marine environment, shipping is the key vector for species globally and the most efficient way to avoid the introduction of new species is successful ballast water management (Molnar et al., 2008; Ojaveer et al., 2014). As the North Sea has been described as one of the most invaded ecoregions of the world (Molnar et al., 2008), the following environmental CBA focuses on ballast water management as a measure to reduce the likelihood of introducing IAS and thereby achieving GES in D2 and contributing to D1, D4, and D6. The analysis addresses the questions of what ecological, economic and social benefits effective ballast water management produces and which indicators are necessary to measure impacts of IAS on ecosystem services and benefits. To facilitate this analysis, for this study two species, the molluscan veined whelk (Rapana venosa) and the Japanese shore crab (Hemigrapsus sanguineus) were chosen. Both of these species do not presently occur in the ECMP but have the potential to arrive as they both already occur in European countries. They have a high potential to impact ecosystem service provision if introduced as shown in other areas, for example R. venosa in the Black Sea (Mann et al., 2004) and H. sanguineus along the French side of the English Channel (Dauvin and Dufossé, 2011). For both management measures, secondary evidence and other information was gathered to assess their potential impacts and how these might affect the ecosystem services and benefits in the ECMP area. Conceptual models were developed which display the linkages between the respective management measures and ecosystem structure, processes, services and the resulting benefits (Figure 2) and serve as the basis for quantifying (and valuing) these impacts. However, these figures are most likely not comprehensive because the link between the properties of ecosystems such as biodiversity and ecosystem services are still a major scientific challenge (Pereira et al., 2010; Strong et al., 2015). Insufficient (quantitative) evidence regarding the impact of both pressures on relevant ecosystems and their services required a scenarios analysis approach to be undertaken. Quantitative evidence was lacking on several levels: data on current ecosystem services provision in the ECMP was not available at the spatial scale necessary. Additionally, uncertainty in terms of effects of noise on ecosystems still exists. The effect of IAS on a naïve habitat is also not predictable. Finally, it is even more uncertain to predict how benefits are impacted for example, is bird abundance reduced when bivalve biomass is reduced, this cannot be predicted (Kendall et al., 2004). Table 5 specifies two environmental scenarios, characterizing low and high impact of each pressure. For IAS scenarios were chosen based on high and low impact classifications as described by Ojaveer et al. (2015). Given the high uncertainty and scarcity of site-specific evidence, assumptions were made to characterize each scenario. With a low (high) impact scenario specifying the lowest (highest) possible impact, a separate environmental CBA can be conducted for each of the environmental scenarios, i.e., for each row in Table 5. Implementation costs of additional MSFD measures fall into the cost category; benefits are the avoided negative impacts of the pressure under study (underwater noise or IAS), i.e., from the difference between a future situation without management and hence with potential low or high negative impacts and a situation with MSFD management (and hence no adverse impacts). Table 5. Development and definition of scenarios in the UK case study. Assumption LCUWN: Only UK Round 2 wind farm projects within the ECMP area will be completed, resulting in the need for pile driving for 374 turbines (4cOffshore, 2016). Asumption H1UWN: All UK Round 2 and 3 wind farm projects within the ECMP area will be completed, resulting in the need for pile driving for 374 Round 2 and 1457 Round 3 turbines, totaling 1831 (4cOffshore, 2016). As for the costs associated with noise reduction measures, Nehls et al. (2007) estimate the costs of using an inflatable sleeve during pile driving in Germany to be approximately €20,000–25,000 per turbine. Between 374 (Assumption LCUWN) and 1831 (Assumption HCUWN) turbines will be installed in the ECMP area until 2020. This means that the total present value cost of using inflatable sleeves to reduce underwater noise during construction ranges between €9.3 and €43.9 m. These figures have been adjusted for inflation. Aggregation over time assumes a 3.5% discount rate as suggested by HM Treasury (2003). Employing noise reducing technology during pile driving increases overall construction time by 3% (Nehls et al., 2007). Assumption LCIAS: Intercontinental shipping traffic in and out of the ECMP area will decrease by 10% compared to average annual arrivals for 2011–2014 reflecting a downturn in international trade. Assumption HCIAS: Intercontinental shipping traffic in and out of the ECMP area will increase by 25% compared to average annual arrivals for 2011–2014 reflecting a large increase in international trade. With these assumptions, further cost monetization is possible. Fernandes et al. (2016) provide estimates of installation and operating costs of such systems on different vessel types. For the UK case study, the assumption is that the technologies examined in Fernandes et al. (2016) will be used by vessels traveling along the UK east coast. Based on average annual ship arrivals data from the Department for Transport and assumptions LCIAS and HCIAS the total discounted cost up to 2020 of installing and operating ballast water treatment systems on all relevant vessels in that area ranges between €3025 and €3929 m, following a change in intercontinental traffic into the area of −10 and +25%, respectively. 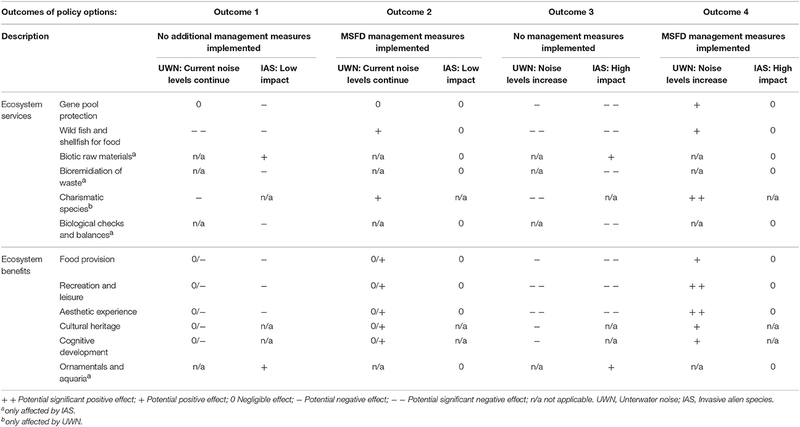 In combination with an explicit list of assumptions to describe the scenarios in Table 5, the environmental CBAs of the low and high impact scenarios produce upper and lower bounds of the net benefit of MSFD PoMs. If a sensitivity analysis were to be conducted, as required by Step 6 of the environmental CBA approach, any assumption can be modified to investigate effects resulting in net benefit figures. In terms of benefits, the impacts of the aforementioned scenarios-response combinations on ecosystem service provision have been assessed qualitatively, based on literature and expert judgment, as there is insufficient site-specific evidence available at this time (Table 6). Benefits of these measures can be assessed through the improvement in ecosystem service provision or the avoided loss of the ecosystem service provision, but are not limited to these. Without quantitative data on the impacts on ecosystem services it was not possible to attribute changes in value of the benefits except in the same qualitative way. Indirect benefits can include any avoided costs (e.g., incurred by industry, local communities, or other specific interest groups) of having to correct or minimize adverse impacts. For example, the eradication of the invasive and non-indigenous carpet sea squirt Didemnum vexillum in Holyhead Marina (Wales) was estimated to cost approximately €150,000 per eradication attempt (Kleeman, 2009). If this cost is avoided due to the implementation of a cessation or reduction measure this can be considered an indirect benefit of that measure. Therefore, the benefit of the measure is a combination of the avoided loss of ecosystem service provision (direct benefit) and the avoided cost of having to address the issue at a latter (and potentially more problematic) stage (indirect benefit). Table 6. Impact of four different settings of UWN and IAS impact and reduction policy options (“outcomes”) on the provision of key ecosystem services and benefits in the UK case study. Due to the high level of uncertainty in the bio-physical data and because of the novelty of this investigation, benefits arising from the measures under investigation could not be quantified in this case study. As a consequence, a quantitative environmental CBA based on an application of Steps 4, 5, and 6 cannot be reported for this area. This case study comprises the Spanish section of the Bay of Biscay (BoB). The most important maritime sectors in this area are: fisheries, ship building, maritime transport (including sea and coastal passenger and freight water transport, inland passenger freight water transport, renting, and leasing of water transport equipment), construction and coastal tourism (Fernández-Macho et al., 2015). Both “fully” and “partially” maritime sectors are taken into account (following terminology from Kalaydjian et al., 2010 and Foley et al., 2014). Of these, fisheries, maritime transport, construction, and coastal tourism are considered “fully” maritime sectors, and sport fishing a “partially” maritime sector. The relevant management measures to reduce the pressures of these sectors on marine ecosystems were identified. These measures can potentially enhance the provision of ecosystem services. For this case study, the most relevant measures potentially contributing to achieving GES in the BoB come from the reformed Common Fisheries Policy (CFP), which came into force on 1 January 2014 (EC, 2013), rather than from the MSFD, thus falling into Categories 1.a and 1.b. Fishing activities cause pressures on the marine environment. These pressures may directly affect Descriptors D1 (biological diversity), D3 (commercial fisheries), and D4 (food webs), and in turn the provision of several ecosystem services and benefits, such as “wild fish and shellfish for food.” The reformed CFP introduces several new changes, such as: legally binding targets to achieve maximum sustainable yield (MSY) for all harvested stocks by 2015; progressive phasing out of discards of unwanted or over-quota fish by 2019; and the establishment of biologically sensitive protected areas, in which fishing activities may be restricted or prohibited. Therefore, the implementation of management measures directly related to the reformed CFP are crucial to achieving GES. Here the three above-mentioned measures have been established in the context of the reformed CFP, which directly affect GES (Category 1.b): the potential elimination of scrapping subsidies1, which ultimately reduce the fishing pressure on commercial fish species and sea-floor integrity; implementation of the new landing obligation which directly affects marine biodiversity and food webs; and the introduction of individual fishing rights which contribute to the new regionalization framework promoted by the CFP that aims to increase the profitability of regional fisheries and ultimately help to reduce fishing pressure on commercial fish species. Benefits associated with food provision were simulated using the bio-economic model FishRent (Salz et al., 2011). This model has been applied to the three management measures related to fisheries specified in Step 1. FishRent is a quantitative assessment model that allows for the evaluation of the bio-economic performance of fleets and therefore, the provision of fish as a food service over the medium (15 years) and long term (25 years). FishRent is composed of six modules: biological (stock-growth relation and biomass function), economic (revenues, costs, cash flow, etc. ), interface (production function, discards and landings), market (price of fish and fuel price), behavior (fleet size, effort and investment), and policy (level of landings and/or the effort involved). A set of scenarios regarding the different FishRent components (stocks, fleets, etc.) were identified for which medium- to long-term simulations were run. The scenario approach takes into account the baseline, the status quo and potential management measures identified in Step 1, for which different endogenous (simulated by FishRent as the fishing effort) and exogenous variables (e.g., first sales prices) associated with external factors (e.g., market prices) are considered. To develop Step 3, both private and public costs of the development and management of the fishing activity are considered. Private costs related to development of the fishing activity are included within the economic module of FishRent. In addition, the public cost programme that exists at the European level (i.e., the European Maritime and Fisheries Fund, EMFF) has also been considered to co-finance the national and regional public cost programmes. However, as most available information regarding the EMFF is aggregated (e.g., different stocks, management measures, countries, etc.) it is difficult to include those public costs within the economic module of FishRent for each proposed measure. Therefore, these public cost are not explicitly considered in the model. To achieve the main objective of Step 3, an impact-analysis (IA) was undertaken to assess the quantitative impacts of new fishing management measures on food (fish) provision and the expected monetary benefits (after EC, 2009). Following Murillas et al. (2011) the value of food provision was assessed using the gross value added, which is the difference between the revenue obtained from fisheries according to the market price and the private costs incurred in the production of the good. In addition, profit is also used when possible. Through the application of FishRent, the NPV of gross value added (and profits) related to fish provision value and to the public costs (investments) from the EMFF for the Basque Country (EMFF hereafter) can be obtained. Expenditure of 6% of the total EMFF budget on scrapping subsidies results in a positive medium-term (15 years) impact on the BoB trawler fleet, leading to a 2.25% increase of NPV of gross value added over this period and a 52% increase of NPV of profits. There is no effect over the long term (i.e., 25 years). Of more importance than the temporal scope is the level of investment needed for this measure (scrapping subsidies). If the allocated investment was lower (< 6%), the impact on the activity, and therefore on food provision, would be over-proportionally reduced. Furthermore, applying subsidies to different fleet segments causes different effects. Investing these subsidies in the management of purse seiners results in an increase of the NPV of gross value added. It would increase by 4.43% in the medium term (38% in the case of profits), and the impact would be extended over the long term. For the analysis of the impact of the implementation of the management measures related to the landing obligation (discard ban) a total research-related public cost of 1% is applied. There is no direct relationship between public cost and economic benefits. This public investment will prevent a decrease of the NPV of gross value added of around 45% of BoB trawler activity over a 15-year period, which might happen when the landing obligation is implemented. From the biological perspective, this leads to a 33% increase in biomass, which might imply a positive impact on the value of fish provision in the long-term. The introduction of transferable individual fishing rights may positively impact on food provision benefits with NPV increasing by around 33% making fishing activity more profitable, thereby supporting economic as well as biological sustainability. An important cost, representing 4% of the total EMFF budget for the Basque Country, is assigned to control and enforcement activities for implementation of the CFP. Its main impact is assessed by assuming a high level of compliance in the application of the management measures. Thus, this additional general cost should also, although partially, be assigned to the environmental CBA of the above measures. Finally, sport fishing is of great interest in the BoB. Input control measures, which limit the effort by controlling the number of vessels involved, are applied. Considering only the boats that are dedicated to sport fishing in the area (N = 376), the vast majority were licensed (98%) and enrolled in the Second Book of Ship Registration held by the Department of Agriculture and Fisheries (92.7%). Thus, only 29 vessels should be removed from this recreational activity. The direct impact on vessel investment, production value and the rent of decommissioning 29 sport fishing vessels is estimated based on Zarauz et al. (2013). Investment is reduced by €1.5 m, which implies a reduction of production and rent of around €2 and €0.5 m, respectively. Lastly, in Step 6 a sensitivity analysis was developed to assess the influence of varying the main external factors (fuel price, fish market prices, etc.) to check the robustness of the expected trend in relation with the NPV of the GVA. A summary of the results is presented in Table 7. Table 7. Bio-socioeconomic impact on ecosystem services resulting from management measures on Bay of Biscay maritime activities. While environmental CBA is an established analytical tool for the appraisal of environmental management measures (Boardman et al., 2006; Hanley and Barbier, 2009), its application within the marine environment, and particularly under the MSFD, is challenging. The main challenge in all three case studies presented here is the limited ecological evidence available for the analyses. This may lead to a focus on only a limited number of ecosystem services which are more easily quantified. Table 8 provides an overview of experience within each case study. However, the Finnish case study, with its greater reliance on eliciting expert opinion, demonstrates an approach which can lead to a quantitative assessment and included a wide range of management measures. Moreover, the Finnish approach can be extended to include an ecosystem service assessment. Table 8. Main findings from the three case studies. A second and related challenge is the scarcity of fit-for-purpose valuation studies that focus specifically on benefits arising from changes in all or specific MSFD Descriptors2. This challenge was highlighted by the limited use of existing valuation studies in the Finnish case and the total absence of such information that could be applied in the UK case study. Only the major cost components of the management measures in the UK study could be monetized. The effect on ecosystem benefits of reducing underwater noise and the likelihood of introducing IAS could only be established in a qualitative way. This is because of the lack of knowledge of the existing level of ecosystem services at the EMCP spatial scale, the effect that both UWN and IAS will have on the ecosystem and the associated services and benefits; and the uncertainty associated with the use of methods such as benefit transfer. For both measures it is therefore safer to do a qualitative assessment but in this way including those services benefits that cannot be valued on monetarily (such as bioremediation or bird watching). The Finnish study adopted a pragmatic alternative for estimating the economic value of marine protection when applicable data are available and conducting extensive new valuation studies is not feasible. Even though the existing studies did not explicitly assess the benefits of achieving GES, the results are suitable for indicating the benefits from the PoMs. Existing results were used as limited resources prevented undertaking new studies. The BoB case study highlighted the clear link between the investment (i.e., private and public costs) and ecosystem service benefits. However, important public costs attached to certain CFP-related management measures cannot be split between specific management measures, which may limit the application of an environmental CBA specific to MSFD Descriptors. The third challenge in the context of practical MSFD implementation, is the lack of public resources to conduct fit-for-purpose valuation studies, such as Norton and Hynes (2014) for the case of Ireland. From a theoretical perspective, it is important in any type of valuation approach to focus on assessing additional benefits, i.e., what is the marginal change in the quantity and value of the benefits relative to what is present under a scenario without the management measure. However, in the case of ecosystem benefits, this has proven challenging due to the uncertainties regarding the marginal change in ecosystem service provision. The economic valuation of the benefits of management measures does not necessarily require new studies to estimate benefits since using estimates from existing studies with a similar context (i.e., benefit transfer) is acceptable practice in ecosystem service valuation or environmental CBA (Richardson et al., 2015). However, without knowing the marginal change in ecosystem service provision, it is difficult to apply these values with any degree of confidence. It is also possible that the direction of change of the economic value of the benefit and ecosystem service provision are not the same. The practice of assigning economic values to ecosystem services is inherently anthropocentric, and therefore benefit values (e.g., those that are measured by willingness to pay) are based on human perceptions. Given current limitation in human knowledge and understanding of the features and functioning of marine and coastal ecosystems, individuals are not always able to see how an improvement in biodiversity or in species populations could affect them (Duarte, 2000). A final challenge highlighted by the case studies, relates to comparing the present values of costs and benefits (Pearce, 1998) for a specific period of time. The discount rate δ is crucial to make costs and benefits incurred at different points in time comparable in the present (Equations 1, 2). The discount rate reflects different levels of desirability between consumption and/or opportunity costs that occur at different points in time (Feldstein, 1964), and it is also an expression of concern regarding the distributional equity between current and future generations and among future generations (Arrow et al., 1995). A positive discount rate means that future values count less and hence are “penalized” and the higher the discount rate, the more future values are penalized. Depending on the discount rate used, benefits that are realized at a later point in time could have lower present values than the costs that are incurred once the measure is implemented affecting the overall outcome of the CBA. Furthermore, CBAs for different management measures may not be comparable if they have not used the same discount rates. The length of the time period, over which costs and benefits are assessed, also affects the total NPV as it determines the temporal extent of the costs and benefits that are considered in the assessment. The MSFD states that GES should be achieved by 2020, however, it does not provide guidance on the time period for assessing the impacts of implementing new management measures to achieve GES. If the assessment covers only the time period from 2016 (when new measures are expected to be implemented) up to 2020 (when GES is supposed to be achieved), the short time span and the impact of discounting on benefits that materialize at the later date mean that there is a risk that costs of implementing new management measures will most often outweigh the benefits. For issues such as changes in the environment, biodiversity or climate change, which can only be detected over longer time periods, using a short time span for assessing the costs and benefits of any policy action is not appropriate. The choice to take action on these issues is a direct recognition that long time spans will be involved and several generations will be affected (Stern, 2006; HM Government, 2011). This means that for the assessment to be meaningful, the time period of assessment needs to be realistic and long enough to take into account any lags in the response of the environment to the implementation of MSFD PoMs. If the management measures under study impact a range of ecosystem services which cannot be easily quantified, the qualitative approach adopted for the UK case study shows how the focus can be kept broad so as not to overlook important impacts of the management measures under consideration. This demonstrates the trade-off between a highly quantified environmental CBA which may only focus on a small number of specific ecosystem services and the broad approach taken in the UK case where quantification is currently problematic. For the latter, multi-criteria analysis (MCA) (Linkov et al., 2006) might be a potential way forward (DCLG, 2009), as it can incorporate cost and benefit measures reported in different units of account (e.g., non-monetized ecosystem service changes). Further research to test the applicability of MCA in this context is needed. A further opportunity relates to the fact that environmental CBA allows for the examination of the trade-offs between different options to achieve GES within the parameters of economic efficiency (OECD, 2006), taking into account other constraints (e.g., discount rate, time period of assessment) that are used in the analysis and how these affect the values that are calculated. Therefore, results of an environmental CBA can help decision-makers to examine trade-offs, giving them the opportunity to develop a PoMs where the discounted net benefits (PVB−PVC) are maximized and which can effectively draw from existing policy actions already implemented to alleviate environmental pressures or even contribute to future policies. Additionally, sensitivity analyses which take into account different levels of the constraints used (e.g., different discount rates, different time periods for assessment) can be undertaken to show the variability of total costs and benefits in the face of different types of uncertainty. With respect to Finnish waters in the Baltic Sea, existing bio-economic models were available for D2 (Non-indigenous species), D3 (Commercial fish and shellfish), and D5 (Eutrophication) but the models would need to have been updated to be applicable in the context of the MSFD. Expert elicitation was a successful alternative approach (to modeling) that provided comprehensive analysis covering all Descriptors. Benefit transfer was relatively straightforward to execute. Even though the original valuation studies only partially covered GES Descriptors, the estimated benefits were higher than the expected costs of the measures. The sensitivity analysis shows that the benefit-cost ratio would have been higher if another set of measures had been chosen. A candidate PoMs, that would not significantly change the probability of achieving GES would decrease the costs from €136.2 to €90 m and thus the benefit-cost ratio would increase from 2–6 to 3–9. 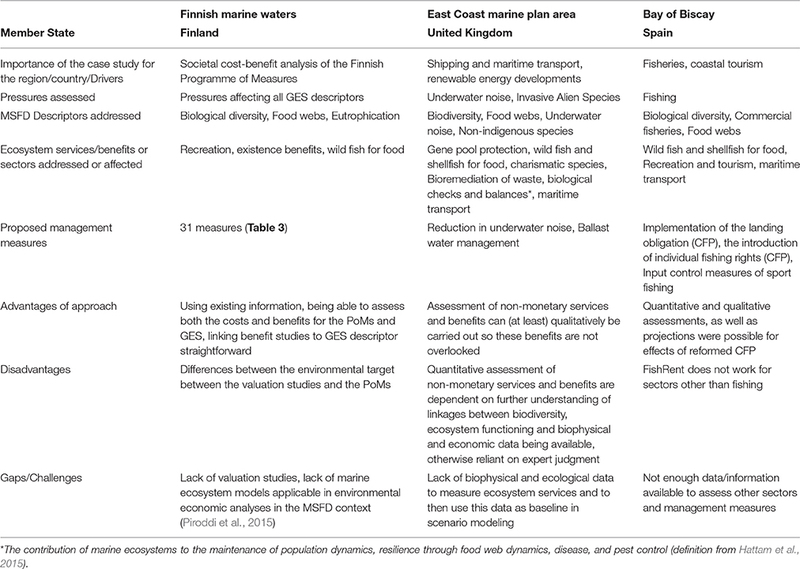 In the East Coast Marine Plan area, UK, scenarios analysis proved a useful tool where there is considerable uncertainty concerning the links between management measures and the ecosystem and the links to welfare impacts. Previous studies have demonstrated that scenarios can be used to “test” which policy actions are robust and sustainable, however it is recognized that the big challenge for using scenario analysis is communicating findings to stakeholders and policy-makers effectively (Burdon et al., 2015). The lack of, and high uncertainty associated with, data restricts the full application of an environmental CBA, in particular there were insufficient site-specific data to assess the potential ecological impact of the management measures (Step 2) and to quantify and value any changes in ecosystem services and welfare benefits (Step 3). As such, these two steps were only partially fulfilled precluding the completion of Steps 4, 5, and 6. In the context of high uncertainty about bio-physical and economic data on the impacts of a PoMs, the preliminary qualitative analysis undertaken in this case study proved valuable in identifying the main ecosystem services which may be affected under each management measure and thus identified areas for further site-specific research. A more in depth analysis, such as a MCA, could now be performed whilst waiting for reliable quantitative data to be made available. In the Bay of Biscay, Spain, many different economic maritime activities operate. However, there has been little previous effort to develop any qualitative or quantitative assessments of impact (ecological or social) of those activities on the value of ecosystem services. One reason for this, amongst others, is that the “partial” maritime nature of most of the sectors involved hinders the extraction of the required data from the available statistics. Due to this limited knowledge only a few new measures are proposed for application to the different private economic activities, with the exception of the commercial fishing sector, which is mainly affected by the newly reformed CFP. The capacity for providing both qualitative and quantitative assessments related to the BoB management measures resulting from the CFP relies on existing bio-economic models that have been developed and applied in other areas of Europe and that are flexible enough to be applied in the BoB. While such models are well developed for commercial fishing activities, models that can be used for other maritime activities are still not sufficiently developed. (1) The environmental CBA approach needs to be further developed to better integrate the ecosystem services approach with established environmental valuation techniques (Börger et al., 2014). To aid this, further research into the linkages between MSFD Descriptors and established ecosystem service classifications is required so that the specific environmental CBA can then be linked to the suitable Descriptor via the affected ecosystem services. This would also help mitigate problems of adjusting existing valuation estimates to situations with slightly different types of environmental change, geographic area or time horizon. However, for pressure indicators (e.g., D5 eutrophication) where existing valuation studies show a reduction in ecological indicators and associated reduced economic values, an ecosystem service approach might be circumvented. In such cases it might be easier to link the existing value estimates directly to the Descriptors and assess the potential impacts on ecosystem services separately. (2) The use of cost-effectiveness analysis is recommended where the measurement of benefits within an environmental CBA is difficult as demonstrated in the first step of the Finnish case study. This shows a way forward as EC (2015) state “CEA [cost-effectiveness analysis] is used when measurement of benefits in monetary terms is difficult” (p. 9). According to the EC Impact Assessment Guidelines, an environmental CBA can be done at various levels, depending on data availability. It can be either a full CBA when the most significant parts of both costs and benefits can be monetized utilizing economic values derived through various economic techniques or a partial environmental CBA in cases where only a part of the costs and benefits can be quantified and/or monetized (EC, 2015, p. 9). (3) Another alternative approach that has potential for application in the context of the MSFD is to use multi-criteria analysis (MCA) in the impact assessment when quantification or monetization are not possible or when impacts are measured in different accounting units (e.g., monetary vs. physical) and have to be compared. The case studies within this paper, the experiences from the UK case in particular, highlight such a case, and how information about environmental change in terms of ecosystem services can be developed for use in MCA. This approach could be accompanied by expert elicitation. (4) Finally, the use of modeling is recommended where appropriate bio-economic and ecosystem models already exist and there is sufficient data to parameterize them, or where there is sufficient data and understanding available to construct new models. For example, if management measures affect ecosystem services for which sufficient data are available as demonstrated in the Spanish case study, bio-economic modeling can provide cost and benefit estimates which can feed into the environmental CBA process. Modeling is also a valuable tool for projecting potential changes in ecosystems service provision in the future where real-time data is not available. In conclusion, this paper has applied an established six-step framework for undertaking environmental CBA to assess PoMs chosen to achieve GES under the MSFD. The application of this framework to three contrasting European case studies has identified a number of challenges for undertaking such an approach. Despite these considerations, this paper has shown that there are opportunities in applying the six-step environmental CBA framework to assess the impact of PoMs under the MSFD. TB, SB, HA, DB, TL, AM, SO, LP, MU and MA conducted the analyses. TB, SB, HA, JA, DB, TL, AM, SO, LP, LR, MU and MA contributed to the writing of the manuscript. This manuscript is a result of DEVOTES (DEVelopment Of innovative Tools for understanding marine biodiversity and assessing good Environmental Status) project, funded by the European Union under the 7th Framework Programme, “The Ocean of Tomorrow” Theme (grant agreement no. 308392), http://www.devotes-project.eu. MU is partially funded through the Spanish programme for Talent and Employability in R + D + I “Torres Quevedo.” MA and SB are partially funded by the Marine Ecosystems Research Programme, Natural Environment Research Council (NERC), and Department for Environment, Food, and Rural Affairs (DEFRA) (grant number NE/L003279/1). The authors wish to thank the two reviewers who's comments have significantly improved the paper. 1. ^Physical scrapping of vessels implies a permanent removal of the vessels from fishing activities. Scrapping subsidies prevent vessels continuing with the activity as there are high costs associated with scrapping vessels. 2. ^Apart from the studies used in the Finnish case study to the best of our knowledge, the only valuation studies relating directly to MSFD Descriptors are Bertram and Rehdanz (2013) and Norton and Hynes (2014). However, Hanley et al. (2015) and Sagebiel et al. (2016) report valuation studies which could also be linked to some Descriptors. 4cOffshore (2016). Available online at: www.4coffshore.com (Accessed on: February 2016). Ahtiainen, H. (2007). The Willingness to Pay for Reducing the Harm from Future Oil Spills in the Gulf of Finland -An Application of the Contingent Valuation Method. Discussion Papers no. 18, Department of Economics and Management, University of Helsinki. Anon (2012). Proposed UK Targets for Achieving GES and Cost-Benefit Analysis for the MSFD. Report prepared for Defra by Cefas, JNCC and UKMMAS (HDBSEG), Lowestoft. Arrow, K. J., Cline, W. R., Maler, K.-G., Munasinghe, M., Squitieri, R., and Stiglitz, J. E. (1995). “Intertemporal equity, discounting, and economic efficiency,” in Climate Change 1995: Economic and Social Dimensions of Climate Change, Contribution of Working Group III to the Second Assessment Report of the Intergovernmental Panel on Climate Change, eds J. P. Bruce, H. Lee, and E. F. Haites (Cambridge: Cambridge University Press), 520–521. Atkins, J. P., Banks, E., Burdon, D., Greenhill, L., Hastings, E., and Potts, T. (2013). An Analysis of Methodologies for Defining Ecosystem Services in the Marine Environment. JNCC Report 491 (Contract number: C12-0170-0612). Atkins, J. P., Burdon, D., and Elliott, M. (2015). “Identification of a practicable set of ecosystem indicators for coastal and marine ecosystem services,” in Coastal Zones Ecosystem Services: From Science to Values and Decision Making, Studies in Ecological Economics, eds R. K. Turner and M. Schaafsma (Heidelberg: Springer). Bateman, I. J., Carson, R. T., Day, B., Hanemann, M., Hanley, N., Hett, T., et al. (2002). Economic Valuation with Stated Preference Techniques: A Manual. Cheltenham: Edward Elgar. Boardman, A. E., Greenberg, D. H., Vining, A. R., and Weimer, D. L. (2006). Cost-Benefit Analysis. Concepts and Practice. Upper Saddle River, NJ: Pearson Education. Burdon, D., Boyes, S. J., Elliott, M., Smyth, K., Atkins, J. P., and Barnes, R. A. (2015). Integrating natural social marine science to manage sustainably vectors of change: Dogger Bank transnational case study. Estuar. Coast. Shelf Sci. doi: 10.1016/j.ecss.2015.09.012. [Epub ahead of print]. Carson, R. T., and Hanemann, W. M. (2005). “Contingent valuation,” in Handbook of Environmental Economics, eds K.-G. Mäler and J. R. Vincent (Amsterdam: Elsevier), 821–936. Cooper, K., Burdon, D., Atkins, J., Weiss, L., Somerfield, P., Elliott, M., et al. (2010). Seabed Restoration Following Marine Aggregate Dredging: Do the Benefits Justify the Costs? MEPF-MALSF Project 09-P115, Cefas, Lowestoft. COWI (2010). Scoping Study on the Requirements for Economic Assessment in the Marine Strategy Framework Directive. European Commission DG Environment. Cummings, R. G., Brookshire, D. S., and Schulze, W. D. (1986). Valuing Environmental Goods. An Assessment of the Contingent Valuation Method. Savage: Rowman & Littlefield. DCLG (2009) Multi-Criteria Analysis: A Manual. London: Department for Communities Local Government. Defra (2007). An Introductory Guide to Valuing Ecosystem Services. London: Department for Environment, Food and Rural Affairs. de Groot, R. S., Fisher, B., Christie, M., Aronson, J., Braat, L., Gowdy, J., et al. (2010). “Integrating the ecological economic dimensions in biodiversity ecosystem service valuation,” in The Economics of Ecosystems and Biodiversity: Ecological and Economic Foundations, ed P. Kumar (London; Washington, DC: Earthscan), 9–40. EC (2009). Impact Assessment Guidelines. Brussels, SEC. EC (2010). COMMISSION DECISION of 1 September 2010 on Criteria and Methodological Standards on Good Environmental Status of Marine Waters (2010/477/EU), European Commission. EC (2013). Regulation (EU) No 1380/2013 of the European Parliament and of the Council of 11 December 20123 on the Common Fisheries Policy. Off. J. Eur. Union L354/22. EC (2014). The First Phase of Implementation of the Marine Strategy Framework Directive (2008/56/EC) - The European Commission's Assessment and Guidance. Brussels: European Commission. EC (2015). Background Document Summarising Experiences with Respect to Economic Analysis to Support Member States with the Development of their Programme of Measures for the Marine Strategy Framework Directive. European Commission DG Environment. Feldstein, M. S. (1964). The social time preference discount rate in cost benefit analysis. Econ. J. 74, 360–379. Freeman, A. M., Herriges, J. A., and Kling, C. L. (2014). The Measurement of Environmental and Resource Values. Theory and Methods, 3rd Edn. Oxon: RFF Press. Haines-Young, R., Paterson, J., Potschin, M., Wilson, A., and Kass, G. (2011). Chapter 25: The UK NEA Scenarios: Development of Storylines and Analysis of Outcomes. The UK National Ecosystem Assessment Technical Report, Cambridge, United Nations Environment Programme World Conservation Monitoring Centre (UNEP-WCMC), 1196–1264. Hanley, N., and Barbier, E. B. (2009). Pricing Nature - Cost-Benefit Analysis and Environmental Policy. Cheltenham: Edward Elgar. Hasler, B., Ahtiainen, H., Hasselström, L., Heiskanen, A.-S., Soutukorva, Å., and Martinsen, L. (2016). Marine Ecosystem Services: Marine Ecosystem Services in Nordic Marine Waters and the Baltic Sea – Possibilities for Valuation. Copenhagen: TemaNord 2016:501. Nordic Council of Ministers. Hawkins, A. D., and Popper, A. N. (2014). Assessing the impact of underwater sounds on fishes and other forms of marine life. Acoust. Today 10, 30–41. HM Government (2011). The Natural Choice: Securing the Value of Nature. London. HM Treasury (2003). The Green Book. London: HM Treasury. Interwies, E., Angeli, D., Bertram, C., Dworak, T., Friedrich, R., Görlitz, S., et al. (2013a). Methodische Grundlagen für Sozio-Ökonomische Analysen sowie Folgenabschätzungen von Maßnahmen einschließlichKosten-Nutzen Analysen nach EG-Meeresstrategie-Rahmenrichtlinie (MSRL). Dessau-Roßlau: Umweltbundesamt (German Federal Environment Agency). Interwies, E., Bertram, C., Dworak, T., Friedrich, R., Görlitz, S., Hiebenthal, C., et al. (2013b). Methodologies Regarding Economic and Social Analyses and Impact Assessments of Measures Including Cost-Benefit-Analyses in the Context of the Marine Strategy Framework Directive. Summary. Dessau-Roßlau: Umweltbundesamt (German Federal Environment Agency). Juntunen, T., Ahtiainen, H., and Mäntyniemi, S. (2013). “A Bayesian approach to address statistical errors and uncertainties in single choice contingent valuation,” in Steps towards Comprehensive Bayesian Decision Analysis in Fisheries and Environmental Management, ed T. Juntunen, Academic Dissertation, Faculty of Biological and Environmental Sciences, University of Helsinki. Kalaydjian, R., Daurès, F., Girard, S., Van Iseghem, S., Levrel, H., and Mongruel, R. (2010). French Marine Economic Data 2009. Plouzané: Ifremer. Kleeman, S. N. (2009). Didemnum Vexillum – Feasibility of Eradication and/or Control. CCW Science report, Report No: 875, 53, CCW, Bangor. Koss, R. S., Knights, A. M., Eriksson, A., and Robinson, L. A. (2011). ODEMM Linkage Framework Userguide. ODEMM Guidance Document Series No.1. EC FP7 project (244273) ‘Options for Delivering Ecosystem-based Marine Management,’ University of Liverpool. Louviere, J. J., Hensher, D. A., and Swait, J. D. (2000). Stated Choice Models. Analysis and Application. Cambridge: Cambridge University Press. Maes, J., Teller, A., Erhard, M., Murphy, P., Paracchini, M. L., Barredo, J. I., et al. (2014). Mapping and Assessment of Ecosystems and their Services Indicators for Ecosystem Assessments under Action 5 of the EU Biodiversity Strategy to 2020. European Commission. 2nd Report-final, February 2014. MAGRAMA (2015). Estrategia Marina. VII Programa de Medidas. Spanish Government, Madrid. Available online at: http://www.magrama.gob.es/es/costas/participacion-publica/vii_programasmedidaseemm_tcm7-406655.pdf (Accessed on: February 2016). Mann, R., Occhipinti, A., and Harding, J. M. (2004). Alien Species Alert: Rapana Venosa (Veined Whelk). International Council for the Exploration of the Sea. MEA (2005). Millennium Ecosystem Assessment. Washington, DC: Island Press. Mitchell, R. C., and Carson, R. T. (1989). Using Surveys to Value Public Goods: The Contingent Valuation Method. Washington, DC: Resources for the future. Nedwell, J., Turnpenny, A., Langworthy, J., and Edwards, B. (2003). Measurements of Underwater Noise during Piling at the Red Funnel Terminal, Southampton, and Observations of Its Effect on Caged Fish. Draft Report prepared for Caltrans District 4. Caltrans, San Francisco, CA. Nedwell, J. R., Langworthy, J., and Howell, D. (2003). Assessment of Sub-Sea Acoustic Noise and Vibration from Offshore Wind Turbines and Its Impact on Marine Wildlife; Initial Measurements of Underwater Noise during Construction of Offshore Windfarms, and Comparison with Background Noise. Subacoustech Report ref: 544R0423. COWRIE. Nehls, G., Betke, K., Eckelmann, S., and Ros, M. (2007). Assessment and Costs of Potential Engineering Solutions for the Mitigation of the Impacts of Underwater Noise Arising from the Construction of Offshore Windfarms. BioConsult SH Report, Husum, COWRIE Ltd.
OECD (2006). Cost-Benefit Analysis and the Environment: Recent Developments. Paris: OECD Publishing. Palmquist, R. B. (1999). “Hedonic models,” in Handbook of Environmental and Resource Economics, ed J. C. J. M. van den Bergh (Cheltenham: Edward Elgar), 765–776. Pearce, D. (1998). Cost-benefit analysis and environmental policy. Oxford Rev. Econ. Policy 14, 84–100. Peck, M. A., Arvanitidis, C., Butenschön, M., Canu, D. M., Chatzinikolaou, E., and Cucco, A., et al. (2016). Projecting changes in the distribution productivity of living marine resources: a critical review of the suite of modelling approaches used in the large European project VECTORS. Estuar. Coast. Shelf Sci. doi: 10.1016/j.ecss.2016.05.019. [Epub ahead of print]. Popper, A. N., Hawkins, A. D., Fay, R. R., Mann, D. A., Bartol, S., Carlson, T. J., et al. (2014). ASA S3/SC1. 4 TR-2014 Sound Exposure Guidelines for Fishes and Sea Turtles. A Technical Report Prepared by ANSI-Accredited Standards Committee S3/SC1 and Registered with ANSI. Heidelberg: Springer. Reinhard, S., de Blaeji, A., Bogaardt, M.-J., Gaaff, A., Leopold, M., Scholl, M., et al. (2012). Cost-Effectiveness and Cost-Benefit Analysis for the MSFD. Framework for the Netherlands. LEI Report, Wageningen University, The Hague. Roberts, L. (2015). Behavioural Responses by Marine Fishes and Macroinvertebrates to Underwater Noise. Ph.D. thesis, University of Hull. Salz, P., Buisman, E., Soma, K., Hans, F., Acadia, P., and Prellezo, R. (2011). FISHRENT, Bioeconomic Simulantion and Optimisation Model for Fisheries. LEI Report 2011-024, May 2011. Stern, N. (2006). The Economics of Climate Change: The Stern Review. Cambridge: Cambridge University Press. TEEB (2010). The Economics of Ecosystems and Biodiversity: Ecological and Economic Foundations. London; Washington, DC: Earthscan. Thomsen, F., Lüdemann, K., Kafemann, R., and Piper, W. (2006). Effects of Offshore Wind Farm Noise on Marine Mammals and Fish. Biola, Hamburg, COWRIE Ltd.
Turner, K., Schaafsma, M., Elliott, M., Burdon, D., Atkins, J., Jickells, T., et al. (2014). UK National Ecosystem Assessment Follow-on. Work Package Report 4: Coastal and marine ecosystem services: principles and practice. UNEP-WCMC, LWEC, UK. Turner, R. K., Hadley, D., Luisetti, T., Lam, V. W. Y., and Cheung, W. W. L. (2010). An Introduction to Socio-Economic Assessment Within a Marine Strategy Framework. Department for Environment, Food, and Rural Affairs, London. Turner, R. K., Mee, L., Elliott, M., Schaafsma, M., Burdon, D., Atkins, J. P., et al. (2015). “Chapter 2. Conceptual framework,” in Coastal Zones Ecosystem Services: From Science to Values and Decision Making. Studies in Ecological Economics, Vol. 9, eds R. K. Turner and M. Schaafsma (Heidelberg: Springer). UK NEA (2011). UK National Ecosystem Assessment: Synthesis of Key Findings. Cambridge: UNEP-WCMC. Ward, F. A., and Beal, D. (2000). Valuing Nature with Travel Cost Models. A Manual. Cheltenham: Edward Elgar. Weilgart, L. S. (2007). A brief review of known effects of noise on marine mammals. Int. J. Comp. Psychol. 20, 159–168. WG-ESA (2010). Economic and Social Analysis for the Initial Assessment for the Marine Strategy Framework Directive: A Guidance Document. European Commission DG Environment, Working Group on Economic and Social Assessment. Zarauz, L., Prellezo, R., Mugerza, E., Artetxe, I., Ibaibarriaga, L., and Roa, R. (2013). Análisis de la Flota Recreativa y de su Impacto Socioeconómico y Pesquero en Euskadi. Revista de investigación marina, RIM. Copyright © 2016 Börger, Broszeit, Ahtiainen, Atkins, Burdon, Luisetti, Murillas, Oinonen, Paltriguera, Roberts, Uyarra and Austen. This is an open-access article distributed under the terms of the Creative Commons Attribution License (CC BY). The use, distribution or reproduction in other forums is permitted, provided the original author(s) or licensor are credited and that the original publication in this journal is cited, in accordance with accepted academic practice. No use, distribution or reproduction is permitted which does not comply with these terms.